That possibility is available now. Using a low-cost, compact plug-and-play platform which runs on everyday hardware. And a no-nonsense SaaS-based software licence. Fundamental Surgery is powered by our proprietary Surgical Haptic Intelligence Engine ™. SHIE ™ technology generates incredibly authentic surgical touch experiences in VR. So it feels like you are really doing surgery. 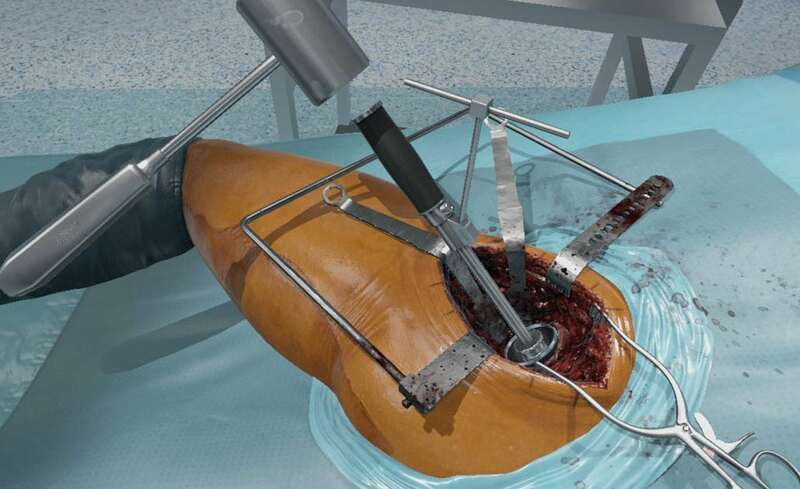 If you look to the future, it’s clear – surgical simulation will allow surgeons all over the world to practice their skills safety, conveniently and cost-effectively. Which has the potential to enhance technical skill, leading to improved patient outcomes. VR is increasingly embraced as the most efficient and cost-effective method for surgical training. With so many offerings though, what sets the standards by which these can be measured, and evaluated? So, obviously, there’s authenticity. Looking for simulation procedures that have been inspired and guided throughout by a panel of senior clinicians. Then there’s the graphical quality of each procedure’s visualisation. The look, feel and sounds of a real OR. But above all, it’s simulation haptics that feeds-back a tactile sense of bone, ligament, and tissue. The distinguishing characteristics of surgical tools. It delivers such an immersive sensation that it is possible to build genuine muscle-memory through practice. That’s the unique combination of VR simulation and SHIE ™ technology that Fundamental Surgery delivers.